Click here to view historic sales data for Downtown and Central Colorado Springs. Scroll down to view the latest listings in Downtown and Central Colorado Springs. Central Colorado Springs offers all of the conveniences of downtown living along with beautiful architectural and natural wonders close by. With easy access to the whole Pikes Peak region and events being held year-round, downtown Colorado Springs provides an exciting and modern environment for any individual or family. Beautiful homes, studio apartments, and everything between are available for rental or purchase throughout the year. Each season brings a variety of exciting events to downtown Colorado Springs. The Pikes Peak or Bust Rodeo hits town every July at the Norris Penrose Event Center, but the party doesn't start until the Rodeo Parade rolls down Tejon Street. Later in July, the Rocky Mountain State Games provides an opportunity for over 10,000 athletes of all ages and skill levels to compete in the state's largest sports festival and is held all across the Springs after the opening ceremony festivities held downtown. In September, the Labor Day Lift Off sees Memorial Park filling up with hot air balloons, food and souvenir vendors, and visitors from all across the United States. Decembring brings the floats, decorations, and parade of the Colorado Springs Festival of Lights. Year-round attractions include visiting the historical campus of Colorado College, seeing how the pros get in shape at the Olympic Training Center, and admiring the incredible collection available to view at the Money Museum. The Pioneers Museum offers a glimpse of life in early Colorado, while several art walks provide a look at modern living in the Springs. With many local shops and boutiques around every corner, downtown has the perfect stop for any shopping need. Clothing options include the state-themed attire of My Colorado Store, the outdoor supplies available at Mountain Chalet, and the creative fashion of Tailored West. Runner's Roost has everything for the running enthusiast, and both the Urban Cyclery and Old Town Bike Shop are open to meet every cyclist's needs. Poor Richard's Bookstore and Hooked on Books have a variety of books an reader, and one of the assortment of thrift and specialty stores are sure to have something for every taste. Speaking of taste, the diverse restaurants downtown have something to cater to every mood and budget. For a great cup of coffee and a snack to go with it, options include the Wild Goose Meeting House, Peak Place, and Dutch Bros. Local restaurant favorites include Phantom Canyon Brewing Company, Jack Quinn's Irish Pub, and José Muldoon's Mexican eatery. Higher-end options are available, as well, at The Famous Steak House, Mackenzie's Chop House, and Sonterra Southwest Grill. The Melting Pot, Coquette's Bistro & Bakery, and Josh & John's Ice Cream all have sweet treats to help finish off any of these great meals. Most municipal services for Colorado Springs have an office downtown, including the Municipal Court, the Parks, Recreation, and Cultural Services, and the offices of City Council and the Mayor. The Penrose Library is located at the center of downtown, and the hub for all Mountain Metropolitan Transit city bus routes is readily available. City parks are open throughout downtown, and anyone can experience Colorado's beauty at Monument Valley Park, Acacia Park, American the Beautiful Park, and Memorial Park. 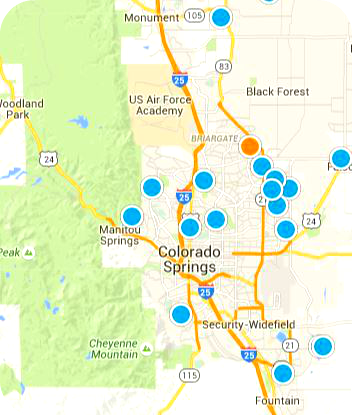 Colorado Springs School District 11 primarily serves the area, but students may apply for district choice to attend school in any other district in the city.